I asked Rick to provide us with his observations during a recent trip to the San Siro in Milan and the Stadio Olimpico in Rome. Please enjoy his excellent commentaries about the fan experience in two different Italian venues. Please note: All images are courtesy of and copyrighted by Rick Olivieri. All rights reserved. I have always wanted to see a Serie A match in person. I was born in Rome and spent 10 years living in Italy, but my father refused to take me to the stadio because “It was too dangerous.” But was it? My father always went back to an incident in 1979, before I was even born, in which Lazio fan Vincenzo Paparelli was hit in the eye by a flare that had been fired by a Roma fan in the opposite end of the stadium. Paparelli later passed away from the injury. That was enough to scare my parents and keep our family away from the stadiums. Fortunately, this summer I was able to not only attend a match at the fabled San Siro, but also at the Stadio Olimpico during a trip to Italy to visit friends and family. My experience was nothing like the one my parent’s envisioned. My soccer experiences in Italy this summer started away from the pitch, as I was invited by a mutual family friend to Rome’s Tor Vergata University to a ceremony in which Sir Alex Ferguson of Manchester United fame was given an award for Ethics in Sport. Not surprisingly, it was a packed house in the auditorium. After some brief remarks in Italian by professors of the university, and a hilarious attempt by another professor to read the same remarks in English (think “Sear” Alex Ferguson of Manchester “Unite” instead of “Sir” Alex Ferguson of Manchester “United”), it was time for the legend himself to speak. Sir Alex was clearly impressed by the crowd as he humbly accepted his reward. His key message to the students in the room was stressing the importance of working hard at whatever you do in order to achieve your goals. He said that he hasn’t changed at all since he was young, even while his players were becoming busy with “Facebooks” and “Twitters.” He also said that he always tells his players to always remember where they come from among their fame and fortune. 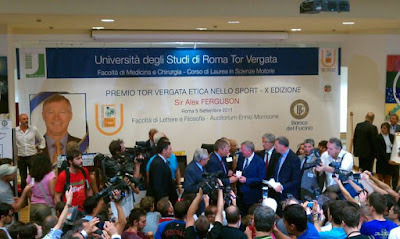 Sir Alex Ferguson at Tor Vergata University in Rome. Sir Alex then spent some time answering a couple questions from students. 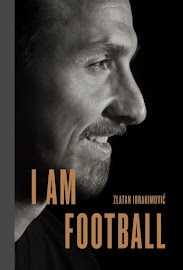 He was very politically correct when asked who the best player he’s ever coached was, naming the likes of Beckham, Christiano Ronaldo, Giggs, Cantona, and Keane. He was also asked about the new Financial Fair Play rules and their effect on football. His first response was to say that the rules weren’t taking effect for another year, so he wasn’t too sure of their impact. He then surprised me by mentioning an example “From hockey in the USA” in which a player was given a “30-year contract” to get around the rules. He was of course referring to the Ilya Kovalchuk situation, in which the NJ Devils offered him a 17-year deal as a way to lower his salary cap hit. Sir Alex was off on the specific details, but I was impressed with his ability to bring up that example. Despite his surly sideline demeanor, it was clear that Sir Alex is a class act. Before the game at the San Siro. The first match I attended during my trip to Italy was the season opening A.C. Milan - Lazio match at the San Siro. The day prior to the match, I took the stadium tour and learned some great tidbits about the stadium. To A.C. Milan fans, the stadium is known as the Stadio San Siro because of it’s location in the San Siro district of Milan. To F.C. Inter fans, it is known by its official name, the Stadio Giuseppe Meazza, named after an Inter player and two-time World Cup winner from the 1930’s who is known as one of the best players of his generation. To others, it is known as “La Scala Del Calcio,” a reference to Milan’s world-renowned Teatro alla Scala opera house. While living in Milan, I had played baseball for the Milano Sparks U-14 and U-15 teams at a facility near the San Siro, but never made it into a match. My first visit inside the stadium was a memorable one. 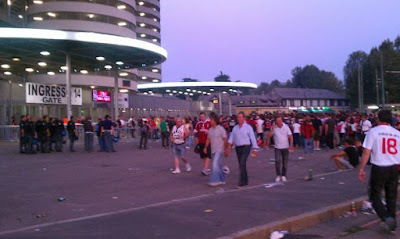 Outside of the stadium in Milan. My experience at San Siro was different than that of the typical fan, as I was seated in the press section of the stadium by my contacts with A.C. Milan. My hotel was only a 20-minute walk from the stadium, so I walked to soak up the game day atmosphere. 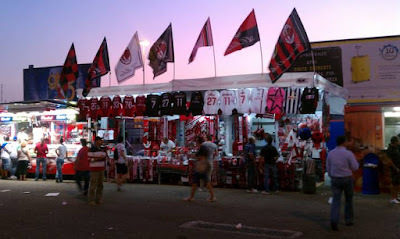 There was definitely a buzz in the neighborhood that started early in the day when street vendors set up tables showcasing their A.C. Milan wares around the metro stop closest to the stadium. As I was walking to the stadium alone in the evening, I kept my eyes peeled, but there were no signs of hooligans or gangs of Laziali (Lazio supporters) out to start trouble. The worst I saw was two teenage boys with what looked like a one-liter water bottle full of beer. The stadium grounds had many mobile food and merchandise vendors, some selling items that didn’t look 100% authentic, but no authorities disturbed them. Outside one of the entrances, tifosi (fans) waiting to enter the stadium chanted while police officers watched nearby, but there was never a hint of violence. I entered through the media entrance. There were two layers of security, one to check my ticket and identification (all soccer tickets in Italy require an identification for purchase and confirmation at the stadium), and another to scan my ticket. The press room was stocked with some snacks and water, and access to Wifi. The seats were located close to midfield in the second tier of the stadium and were blocked off from the regular seats. We had a great view of the match, and stadium security stood guard at each corner of our section. No Wifi in the seats, however, meaning that my Tweets would be limited to pregame, halftime, and post-match. 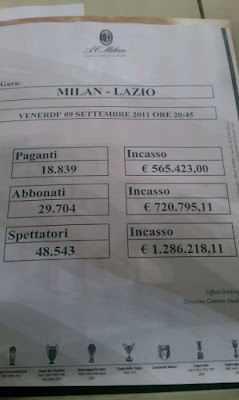 AC Milan: Abbonati = season ticket holders. Paganti = tickets at gate. Incasso = Total gate receipts in euros. The announced attendance was 48,543, not nearly at the stadium’s 82,995 capacity, but the supporters made for a great atmosphere nonetheless. 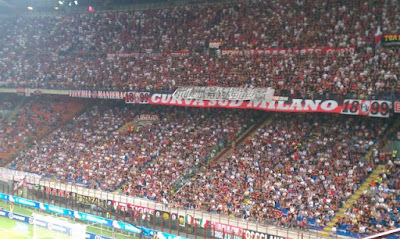 The Curva Sud Milano was packed and in full-voice for the match. I only saw a couple smoke flares lit during the match, and the supporters seemed most interested in supporting their club with their voices. A night match under the lights at the San Siro is a sight to see. You really get the impression that you’re about to witness something special. A.C. Milan entered the field while the team’s anthem blared over the loudspeaker. The anthem features the lyrics, “Milan, Milan, solo con te, Milan, Milan sempre per te.” Meaning, “Milan, Milan, only with you, Milan, Milan, always for you.” The supporters sang along to the song in full voice. When the players took the field for the starting lineups, the P.A. announcer read all the players first names, and let the supporters yell out their last names. At the kickoff between AC Milan and Lazio. The match itself was the disjointed affair that one would expect from an opening weekend match. New Lazio acquisition Miroslav Klose opened his 2011-12 account with a goal in the 12th minute, giving Lazio a lead that was extended just six minutes later, by another summer acquisition, Djibril Cisse. To my surprise, the gentleman next to me in the press box was very vocal in his exultation after the two Lazio goals, a major faux pas here in the U.S. My only thought was that perhaps he too was connected to one of the teams in some way rather than a credentialed media member. Going down two-nil at home certainly wasn’t the start that the defending Serie-A champions would have hoped for. To their credit, the tifosi in the Curva chanted louder as they urged on their team. They were rewarded in the 29th minute when Zlatan Ibrahimovic ran onto a pass from Antonio Cassano and put the Rossoneri on the board. A quick strike equalizer came just four minutes later, as a cross from Milan’s key summer signing, Alberto Aquilani, found the head of Cassano. The rest of the match was a quiet one, as the two teams were clearly not in peak form. Milan missed a few chances to go ahead, including Cassano’s rocket that hit the post. At the end of the night both teams should have been pleased with the result. One interesting thing to note was the P.A. announcements repeated two or three times during the last 10 minutes of the match, directed at the visiting team supporters, instructing them to remain in their seats until the stadium had cleared out. An acquaintance from the La Gazzetta dello Sport, one of Italy’s sports newspapers, explained to me that the Laziali were going to be escorted by police to an area fenced off from other fans, where they would then be put on buses, taken directly to the train station and then put on a train back to Rome. The authorities should be applauded for their proactive approach to preventing fan violence. My walk home from the stadium was also uneventful, and at no point did I ever feel in any danger. 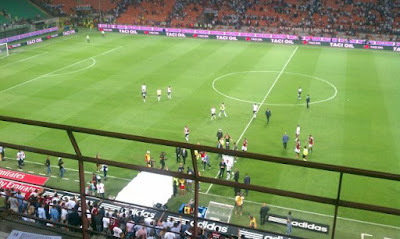 Players departing the pitch after the game at the San Siro. My second match of the weekend was Roma-Cagliari. 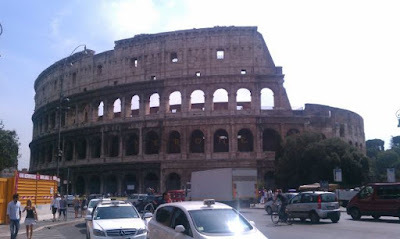 In Rome, I had lived on Monte Mario, a stone’s throw from the Stadio Olimpico (Olympic Stadium). I could hear the chanting and roar of the crowd on game days, but was never allowed to go. Talk about torture! I finally attended my first Roma match with some family friends who hadn’t been to a match at the Olimpico in many years. The ticket purchasing process had required collecting everyone’s ID cards (and my passport) for our friend to display at one of the ticketing centers located around Rome. All of our tickets had our full names on them. We purchased tickets in the Curva Sud behind one of the goals, where Roma’s Ultras (the hard-core supporters) typically sit. 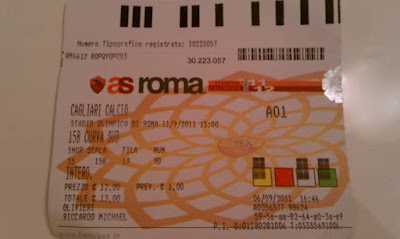 One of the most prized tickets in Rome for a Roma fan. It was a beautiful Roman day for an afternoon match. The walk to the stadium featured fewer food and merchandise vendors than the San Siro, but most of the supporters were heading to the match after a great meal at a local ristorante (as was I!). The Stadio Olimpico featured a triple-layer of security for supporters in the Curva Sud. The first was the ticket and identification check well away from the stadium gates. Once you passed through that fence, there was a bag check closer to the gates. Last, but not least, were the ticket scanners and turnstiles. Upon arriving to our seats, I was extremely surprised to see many of them covered in dust and bird droppings. There were also cobwebs on the glass dividers meant to separate the ultras from the more expensive seats along the sidelines. For the first match of the season, I would have expected a cleaner stadium. No one else seemed phased though, as everyone’s focus was directed on the players and warm-ups. I guess that’s the price of community-owned and run stadiums. The clubs have little control over such stadium matters. Conspicuously absent from both matches I attended was a playing of the national anthem as you would hear at U.S. sporting events. Instead, “Roma, Roma,” a beautiful anthem by famous Italian singer Antonello Venditti (and A.S. Roma supporter) played over the loudspeakers. To my amazement, all 33,000 supporters at the stadium sang the lyrics at the top of their lungs while waving their flags and holding up their scarves. The scene gave me goosebumps. The only thing I could compare it to was my first time seeing 80,000+ fans doing the Warchant at FSU’s Doak Campbell Stadium. This might have been even more impressive. As the players started walking out onto the field for the match, the singing got even louder. The kicker was when the audio was turned off for a verse so that only the voices of the tifosi were heard. It was incredible. The Curva Sud in Milan was great, but nothing compared to this. Much the same as at the San Siro, when the starting lineup for the home team was announced, all the P.A. announcer said was the player’s first names and let the tifosi yell their last names. There were a few of the typical flares or smoke bombs, and one loud blast from what was likely an M-80 firecracker. Other than that, I didn’t see anything remotely violent in the stadium. 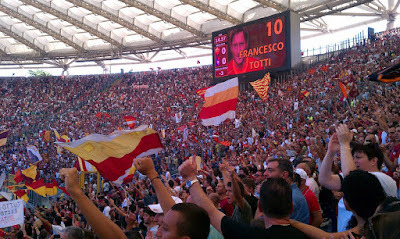 In fact, I learned that Roma has introduced a “family section” in a corner of the Stadio Olimpico. 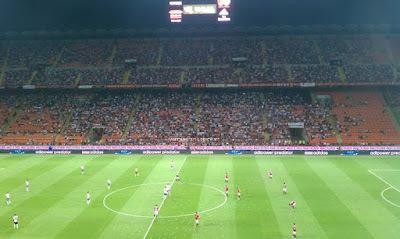 It wasn’t packed, but the fans seated there were a start and an important initiative for the Serie A team. viewed the game on September 11th, 2011. Surprisingly, new Roma boss Luis Enrique went with FIVE new Serie-A players on the pitch, including goalkeeper Maarten Stekelenburg, defenders Gabriel Heinze and Jose Angel, Miralem Pjanic, and forward Bojan Krkic. The match started off much like the A.C. Milan-Lazio game did, with little action and disjointed play for teams that looked like they hadn’t had a competitive match in months. With Francesco Totti, Simone Perrotta, and Daniele De Rossi in the midfield, Roma was able to control possession, but created few true chances on goal. The tifosi in the Curva Sud did their best to cheer on the team. The second half was disastrous for the home side. In the 68th minute, young defender Jose Angel’s poorly headed clearance off a cross dropped at the feet of Cagliari’s Daniele Conti, who slotted home and gave the visitors a 1-nil lead. Compounding matters was Angel’s expulsion just one minute later. Pressing forward into the attack, he lunged at the feet of Davide Astori after giving up the ball in the Cagliari penalty area. While it was a rash tackle born out of frustration, I’m not sure that it deserved a red card. Up until that point, Angel’s Serie A debut had been a solid one. To Roma’s credit, down a man and down a player, the team kept battling. Totti had two great chances that were somehow saved by Cagliari goalkeeper Michael Agazzi. The fourth official signaled that there were to be four minutes of injury time, and there was a buzz in the stands as the supporters could sense a draw coming. Unfortunately, their hopes were dashed by El Kabir’s strike on the counter, making it 2-nil in injury time to the visitors. The small section of Cagliari supporters in the top corner of the arena celebrated, as well they should- the victory would mark their first win over Roma in 27 road trips to the Eternal City! Daniele De Rossi scored on a last minute rebound from a Totti free kick to bring one back to the home team, but the referee would blew the final whistle at almost the same time. What a trip! I accomplished both goals I had for my visit to Italy: to see old friends and family, and finally catch a match at the San Siro. Seeing Sir Alex Ferguson in Rome and sitting in the Curva Sud for the Roma match really put things over the top. Both matches had different, but equally special atmospheres. A night match at the San Siro really gave you the impression of being at a grand event. The seats are close to the pitch and at a sharp angle, bringing you close to the action. The Stadio Olimpico has an Olympic track around it, putting fans further back from the action, but the vigor and enthusiasm of their tifosi really impressed me. While the tifosi were extremely passionate, and there was a lot of cursing, yelling, and singing, not once did I ever feel in danger or feel like something bad was about to happen. What else is there to say other than I can’t wait to get back for another match! This article was graciously translated into Italian by Greta Faccani of the Roman site, Vocegiallorossa. Rick, thank you very much for sharing this excellent commentary with my audience.